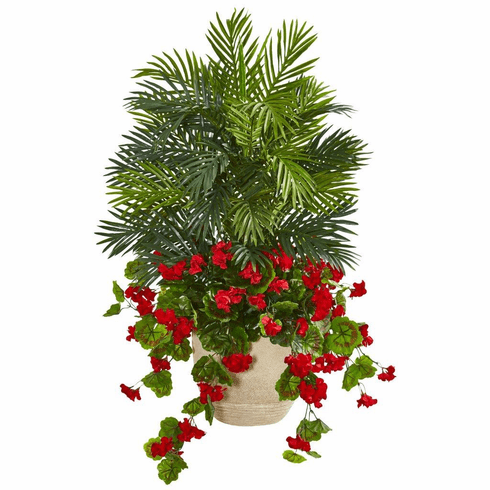 This areca palm artificial plant has a bed of lifelike geraniums that almost beg to be smelled, and towering over them is a lush display of palm leaves with realistic green fronds that fan out in every direction. With so much color and life in one display, this would be the perfect stand-alone piece to place in your enclosed porch next to your bookcase. Height: 3.5 Ft., Width: 28 In., Depth: 28 In., Color: , Pot Size: H: 11 In. W: 12 In. D: 12 In.